Elongated tear-shaped outline. 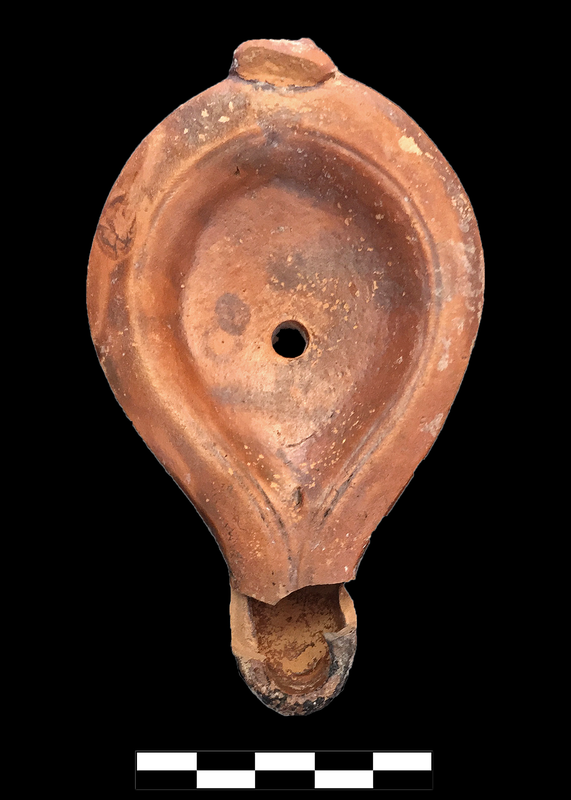 Tear-shaped discus with point, plain, concave with central filling hole, narrow, rounded framing ring, and small unfinished airhole at front. Narrow, sloping shoulder. Elongated, rounded nozzle; traces of burning. Ring handle applied to back rim and down back wall midway to base. Flat, tear-shaped base with single groove and central planta pedis (right foot) with big toe pointing to nozzle. Crisply designed and executed. 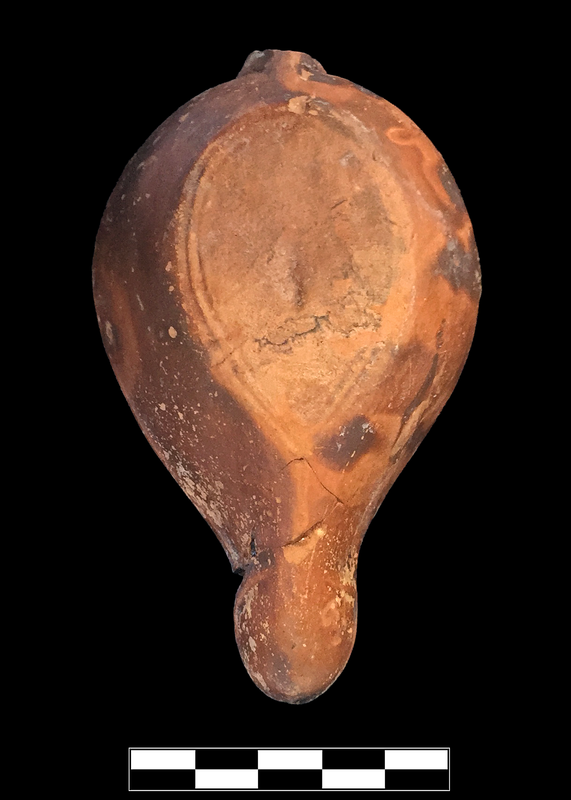 Two ridges descend diagonally from seam on walls roughly at base of nozzle: these do not correspond with volutes and appear to be marks from molding in this otherwise carefully executed lamp. Fabric: 2.5YR 6/6, light red. Slip: 5YR 6/8, reddish yellow, to 5YR 4/4, reddish brown . Fine, somewhat hard fabric with very rare, very small, subangular(?) black inclusions and common flecks of golden micaSomewhat thick, semilustrous, even but mottled around sides preserved over whole body and continuing inside. Distinct metallic sheen; very smooth surface with brushstrokes evident along front shoulders and across base. Knidian. Three joining sherds preserve entire vessel except for chips from nozzle and missing handle above attachment. Good condition but very slight patches of abrasion around front walls.